The School of Nursing recently transferred a collection of administrative and programming records to University Archives. These materials will be added to the existing School of Nursing collection. The records include files and correspondence from the two previous deans, Sandra Edwardson (1991-2004) and Ellen Fahy (1980-1990). Other administrative records include credentialing, grant reporting, and the proposal for establishing a Ph.D. program. Also included are files for the block nurse program, the Community-University Health Care Center (CUHCC), and work related to the Center for American Indians and GLBT Studies. In addition, materials related to the alumni association and the School of Nursing Diamond Jubilee (1984) are part of this transfer. The collection is approximately 6 linear feet at its acquisition. 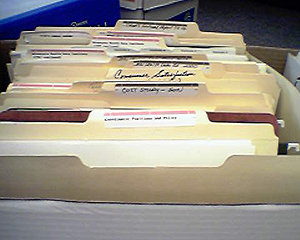 The boxes are all labeled with content information at the folder level. The material is in good condition although it will need to be reboxed and hanging file folders removed. Further accruals are expected. I’d like to commend the School of Nursing for taking a proactive approach to securing a permanent home for its records. The current dean, Connie Delaney, is a Fellow of the American College of Medical Informatics and is a past faculty member of the School of Library Science at the University of Iowa, so she understands the importance of preserving and using information. A recent acquisition to the archives project is the records for the Alpha Epsilon Iota women’s medical fraternity. 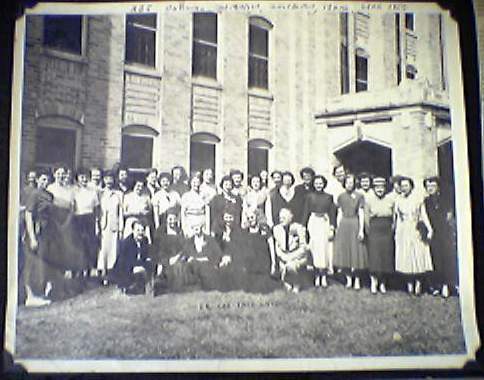 In 1901 women medical students at the University opened the fifth national chapter of AEI that acted as a support organization by providing housing, social activities and fundraising. Ruth Boynton was an early alumna of AEI and later assisted the organization during the 1940s. During the increased enrollments of women in the medical school in the 1970s, the AEI had a difficult time maintaining its identity and holdings. In 1979 it sold its two properties at 524 & 528 Ontario St. SE. In 1982 the AEI split into two separate organizations, the AEI Foundation and the Minnesota Women Physicians. Proceeds from the sale of the properties helped to establish the AEI Foundation. The collection is approximately 1 linear foot and contains AEI meeting minutes, incorporation documents, and records related to the sale of the fraternity’s houses and start up of the foundation. There is also a scrap book documenting social activities and news clippings of AEI students/alumni during the 1950s.